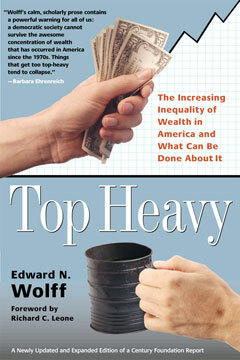 A work that sparked widespread controversy when it was first published, Top Heavy is acclaimed economist Edward N. Wolff’s eloquent presentation of the facts of wealth inequality in the United States. In a completely revised and updated edition of the book the Boston Review hailed as “the leading contemporary study of the distribution of wealth,” Wolff reveals the unprecedented rise in recent years of wealth inequality and shows how it is one of the major forces challenging democracy and economic opportunity in America. Wolff vividly illustrates how the gap between the haves and the have-nots in terms of wealth is greater now than at any time since 1929, immediately preceding the Great Depression. As the nation considers trillion-dollar tax cuts and the abolishment of the estate tax, Top Heavy takes a sobering look at how the wealth of the top 1 percent of households continues its heart stopping expansion while the current distribution of wealth in America invites the surprisingly apt comparison with the class-dominated societies of nineteenth-century Europe. Top Heavy will continue to be an essential reference point in any discussion of what an economically healthy America might look like.